Destini's automated data feed brings together SPINS, IRI, and Nielsen data from 100,000+ retail locations. With Destini, brands can measure sales for every SKU in their specialty, grocery, convenience, natural, club, and mass retail accounts. Destini data is now accessible through Repsly's retail execution software, empowering field teams to take action based on store-level sales performance. and track team performance and retail execution against goals. 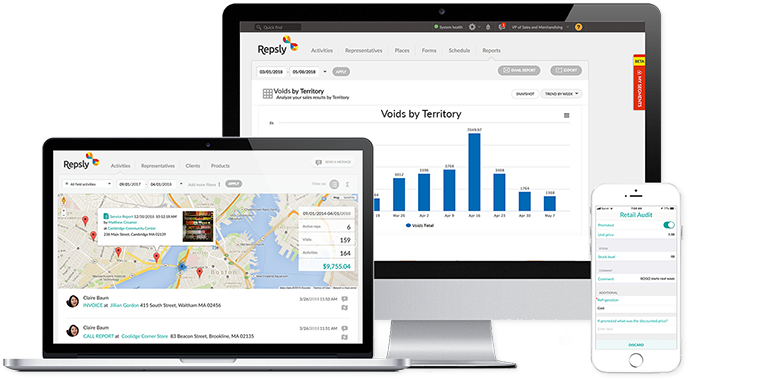 Made even more powerful with Destini data, Repsly gives reps everything they need to start data-driven conversations with retailers and maximize opportunity at every store. Identify out-of-stocks and negotiate for additional facings to make up for lost sales. Back up new retailer pitches with sales data from similar or competing stores. Prioritize SKUs by performance at the store level, and adjust orders and promotions as necessary. Measure the effect of in-store promotions, sales, and merchandising strategies on sales volume. Track competitor activity, monitor its effect on sales volume, and plan competitive promotions. Use historical sales data to pitch additional SKUs or larger bundles to retailers with opportunity for growth.